This is one of those rare films that win your heart with so much warmth and goodness. 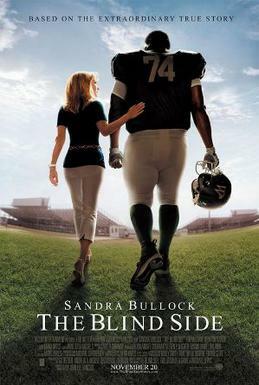 The Blind Side is a beautiful film about love, family and compassion. Director, John Lee Hancock’s film is based on a true story about a homeless African-American teenager who is supported by a well-to-do white family. Michael Oher (Quinton Aaron) is a 17-year old boy with a troubled past. He is helped by Leigh Anne Tuohy (Sandra Bullock) and her family to become a successful football player. The film is about Michael’s extraordinary journey where he discovers the real meaning of having a family and experiences unconditional love. In her career best performance, Sandra Bullock is extremely convincing as a rich interior designer who is passionate about football since her cheer-leading days in college. She is strong, confident and runs her family her own way. Her bond with Michael is extremely special as she becomes more of a mother to him than her real children. Quinton Aaron is also brilliant as Michael and you are able to empathise with him, the moment he comes on screen. Sandra Bullock has already won the Screen Actors Guild and the Golden Globe awards amongst others for this film and is a favourite to bag an Oscar too. This is the first time I would be happy if Meryl Streep (Julie & Julia) does not win at the awards. Do yourself a favour, watch The Blind Side and leave all your cynicism outside the theatre.